For other uses, see Abraham (disambiguation). "Avraham" redirects here. For people with the given name, see Avraham (given name). For people with the surname, see Avraham (surname). "Abram", "Avram", and "Ibrahim" redirect here. For other uses, see Abram (disambiguation), Avram (disambiguation), and Ibrahim (disambiguation). Abraham,[a] originally Abram,[b] is the common patriarch of the three Abrahamic religions. In Judaism, he is the founding father of the covenant of the pieces, the special relationship between the Jewish people and God; in Christianity, he is the prototype of all believers, Jewish or Gentile; and in Islam he is seen as a link in the chain of prophets that begins with Adam and culminates in Muhammad. The narrative in Genesis revolves around the themes of posterity and land. Abraham is called by God to leave the house of his father Terah and settle in the land originally given to Canaan but which God now promises to Abraham and his progeny. 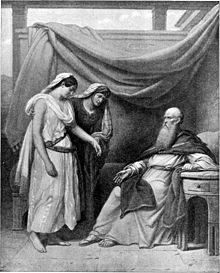 Various candidates are put forward who might inherit the land after Abraham; and, while promises are made to Ishmael about founding a great nation, Isaac, Abraham's son by his half-sister Sarah, inherits God's promises to Abraham. Abraham purchases a tomb (the Cave of the Patriarchs) at Hebron to be Sarah's grave, thus establishing his right to the land; and, in the second generation, his heir Isaac is married to a woman from his own kin, thus ruling the Canaanites out of any inheritance. Abraham later marries Keturah and has six more sons; but, on his death, when he is buried beside Sarah, it is Isaac who receives "all Abraham's goods", while the other sons receive only "gifts" (Genesis 25:5–8). The Abraham story cannot be definitively related to any specific time, and it is widely agreed that the patriarchal age, along with the exodus and the period of the judges, is a late literary construct that does not relate to any period in actual history. A common hypothesis among scholars is that it was composed in the early Persian period (late 6th century BCE) as a result of tensions between Jewish landowners who had stayed in Judah during the Babylonian captivity and traced their right to the land through their "father Abraham", and the returning exiles who based their counter-claim on Moses and the Exodus tradition. Terah, the ninth in descent from Noah, was the father of three sons: Abram, Nahor, and Haran. The entire family, including grandchildren, lived in Ur of the Chaldees. In his youth, Abram worked in Terah's idol shop. Haran was the father of Lot, and thus Lot was Abram's nephew. Haran died in his native city, Ur of the Chaldees. When they came back to the Bethel and Hai area, Abram's and Lot's sizable herds occupied the same pastures. This became a problem for the herdsmen who were assigned to each family's cattle. The conflicts between herdsmen had become so troublesome that Abram suggested that Lot choose a separate area, either on the left hand or on the right hand, that there be no conflict amongst brethren. Lot chose to go eastward to the plain of Jordan where the land was well watered everywhere as far as Zoar, and he dwelled in the cities of the plain toward Sodom. Abram went south to Hebron and settled in the plain of Mamre, where he built another altar to worship God. Abraham, Sarah and Hagar, imagined here in a Bible illustration from 1897. Abram and Sarai tried to make sense of how he would become a progenitor of nations, because after 10 years of living in Canaan, no child had been born. Sarai then offered her Egyptian handmaiden, Hagar, to Abram with the intention that she would bear him a son. One of the visitors told Abraham that upon his return next year, Sarah would have a son. While at the tent entrance, Sarah overheard what was said and she laughed to herself about the prospect of having a child at their ages. The visitor inquired of Abraham why Sarah laughed at bearing a child at her age, as nothing is too hard for God. Frightened, Sarah denied laughing. In the early and middle 20th century, leading archaeologists such as William F. Albright and biblical scholars such as Albrecht Alt believed that the patriarchs and matriarchs were either real individuals or believable composites of people who lived in the "patriarchal age", the 2nd millennium BCE. But, in the 1970s, new arguments concerning Israel's past and the biblical texts challenged these views; these arguments can be found in Thomas L. Thompson's The Historicity of the Patriarchal Narratives (1974), and John Van Seters' Abraham in History and Tradition (1975). Thompson, a literary scholar, based his argument on archaeology and ancient texts. His thesis centered on the lack of compelling evidence that the patriarchs lived in the 2nd millennium BCE, and noted how certain biblical texts reflected first millennium conditions and concerns. Van Seters examined the patriarchal stories and argued that their names, social milieu, and messages strongly suggested that they were Iron Age creations. By the beginning of the 21st century, archaeologists had given up hope of recovering any context that would make Abraham, Isaac or Jacob credible historical figures. Abraham's name is apparently very ancient, as the tradition found in Genesis no longer understands its original meaning (probably "Father is exalted" – the meaning offered in Genesis 17:5, "Father of a multitude", is a popular etymology). The story, like those of the other patriarchs, most likely had a substantial oral prehistory. At some stage the oral traditions became part of the written tradition of the Pentateuch; a majority of scholars believe this stage belongs to the Persian period, roughly 520–320 BCE. The mechanisms by which this came about remain unknown, but there are currently two important hypotheses. The first, called Persian Imperial authorisation, is that the post-Exilic community devised the Torah as a legal basis on which to function within the Persian Imperial system; the second is that Pentateuch was written to provide the criteria for who would belong to the post Exilic Jewish community and to establish the power structures and relative positions of its various groups, notably the priesthood and the lay "elders". Nevertheless, the completion of the Torah and its elevation to the centre of post-Exilic Judaism was as much or more about combining older texts as writing new ones – the final Pentateuch was based on existing traditions. In Ezekiel 33:24, written during the Exile (i.e., in the first half of the 6th century BCE), Ezekiel, an exile in Babylon, tells how those who remained in Judah are claiming ownership of the land based on inheritance from Abraham; but the prophet tells them they have no claim because they do not observe Torah. Isaiah 63:16 similarly testifies of tension between the people of Judah and the returning post-Exilic Jews (the "gôlâ"), stating that God is the father of Israel and that Israel's history begins with the Exodus and not with Abraham. The conclusion to be inferred from this and similar evidence (e.g., Ezra-Nehemiah), is that the figure of Abraham must have been preeminent among the great landowners of Judah at the time of the Exile and after, serving to support their claims to the land in opposition to those of the returning exiles. Abraham is given a high position of respect in three major world faiths, Judaism, Christianity and Islam. In Judaism he is the founding father of the Covenant, the special relationship between the Jewish people and God – a belief which gives the Jews a unique position as the Chosen People of God. In Christianity, the Apostle Paul taught that Abraham's faith in God – preceding the Mosaic law – made him the prototype of all believers, circumcised and uncircumcised. The Islamic prophet Muhammad claimed Abraham, whose submission to God constituted Islam as a "believer before the fact" and undercut Jewish claims to an exclusive relationship with God and the Covenant. In Jewish tradition, Abraham is called Avraham Avinu (אברהם אבינו), "our father Abraham," signifying that he is both the biological progenitor of the Jews and the father of Judaism, the first Jew. His story is read in the weekly Torah reading portions, predominantly in the parashot: Lech-Lecha (לֶךְ-לְךָ), Vayeira (וַיֵּרָא), Chayei Sarah (חַיֵּי שָׂרָה), and Toledot (תּוֹלְדֹת). In Jewish legend, God created heaven and earth for the sake of the merits of Abraham. After the deluge, Abraham was the only one among the pious who solemnly swear never forsaking God, and studied in house of Noah and Shem to learn about "Ways of God," and continuing the line of High Priest from Noah and Shem, then he descended the office to Levi and his seed forever. Before leaving his fathers' land, Abraham was miraculously saved from the fiery furnace of Nimrod following his brave action of breaking the idols of the Chaldeans into pieces. During his sojourning in Canaan, Abraham was accustomed to extend hospitality to travelers and strangers and taught how to praise God also knowledge of God to those who had received his kindness. Besides Isaac and Jacob, he is the one whose name would appear united with God, as God in Judaism was called Elohei Abraham, Elohei Yitzchaq ve Elohei Ya`aqob ("God of Abraham, God of Isaac, and God of Jacob") and never the God of any one else. He was also mentioned as the father of thirty nations. Abraham does not loom so large in Christianity as he does in Judaism and Islam. It is Jesus as the Jewish Messiah who is central to Christianity, and the idea of a divine Messiah is what separates Christianity from the other two religions. In Romans 4, Abraham's merit is less his obedience to the divine will than his faith in God's ultimate grace; this faith provides him the merit for God having chosen him for the covenant, and the covenant becomes one of faith, not obedience. The Roman Catholic Church calls Abraham "our father in Faith" in the Eucharistic prayer of the Roman Canon, recited during the Mass (see Abraham in the Catholic liturgy). He is also commemorated in the calendars of saints of several denominations: on 20 August by the Maronite Church, 28 August in the Coptic Church and the Assyrian Church of the East (with the full office for the latter), and on 9 October by the Roman Catholic Church and the Lutheran Church–Missouri Synod. In the introduction to his 15th-century translation of the Golden Legend's account of Abraham, William Caxton noted that this patriarch's life was read in church on Quinquagesima Sunday. The Eastern Orthodox Church commemorates him as the "Righteous Forefather Abraham", with two feast days in its liturgical calendar. The first time is on 9 October (for those churches which follow the traditional Julian Calendar, 9 October falls on 22 October of the modern Gregorian Calendar), where he is commemorated together with his nephew "Righteous Lot". The other is on the "Sunday of the Forefathers" (two Sundays before Christmas), when he is commemorated together with other ancestors of Jesus. Abraham is also mentioned in the Divine Liturgy of Saint Basil the Great, just before the Anaphora, and Abraham and Sarah are invoked in the prayers said by the priest over a newly married couple. Islam regards Abraham as a link in the chain of prophets that begins with Adam and culminates in Muhammad.Ibrāhīm is mentioned in 35 chapters of the Quran, more often than any other biblical personage apart from Moses. He is called both a hanif (monotheist) and muslim (one who submits), and Muslims regard him as a prophet and patriarch, the archetype of the perfect Muslim, and the revered reformer of the Kaaba in Mecca. Islamic traditions consider Ibrāhīm (Abraham) the first Pioneer of Islam (which is also called millat Ibrahim, the "religion of Abraham"), and that his purpose and mission throughout his life was to proclaim the Oneness of God. In Islam, Abraham holds an exalted position among the major prophets and he is referred to as "Ibrahim Khalilullah", meaning "Abraham the Beloved of Allah". Besides Ishaq and Yaqub, Ibrahim is among the most honorable and the most excellent men in sight of God. Ibrahim was also mentioned in Quran as "Father of Muslims" and the role model for the community. Paintings on the life of Abraham tend to focus on only a few incidents: the sacrifice of Isaac; meeting Melchizedek; entertaining the three angels; Hagar in the desert; and a few others. 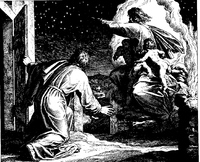 Additionally, Martin O'Kane, a professor of Biblical Studies, writes that the parable of Lazarus resting in the "Bosom of Abraham", as described in the Gospel of Luke, became an iconic image in Christian works. According to O'Kane, artists often chose to divert from the common literary portrayal of Lazarus sitting next to Abraham at a banquet in Heaven and instead focus on the "somewhat incongruous notion of Abraham, the most venerated of patriarchs, holding a naked and vulnerable child in his bosom". Several artists have been inspired by the life of Abraham, including Albrecht Dürer (1471–1528), Caravaggio (1573–1610), Donatello, Raphael, Philip van Dyck (Dutch painter, 1680–1753), and Claude Lorrain (French painter, 1600–1682). Rembrandt (Dutch, 1606–1669) created at least seven works on Abraham, Peter Paul Rubens (1577–1640) did several, Marc Chagall did at least five on Abraham, Gustave Doré (French illustrator, 1832–1883) did six, and James Tissot (French painter and illustrator, 1836–1902) did over twenty works on the subject. 16th century plaster cast of a late Roman era Sacrifice of Isaac. 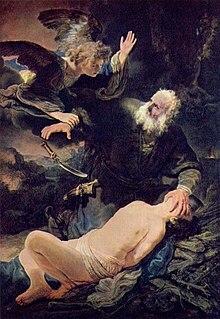 The hand of God originally came down to restrain Abraham's knife (both are now missing). 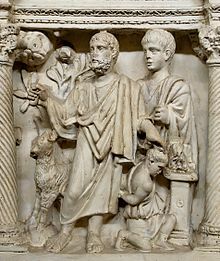 The Sarcophagus of Junius Bassus depicts a set of biblical stories, including Abraham about to sacrifice Isaac. These sculpted scenes are on the outside of a marble Early Christian sarcophagus used for the burial of Junius Bassus. He died in 359. This sarcophagus has been described as "probably the single most famous piece of early Christian relief sculpture." The sarcophagus was originally placed in or under Old St. Peter's Basilica, was rediscovered in 1597, and is now below the modern basilica in the Museo Storico del Tesoro della Basilica di San Pietro (Museum of St. Peter's Basilica) in the Vatican. The base is approximately 4 × 8 × 4 feet. The Old Testament scenes depicted were chosen as precursors of Christ's sacrifice in the New Testament, in an early form of typology. Just to the right of the middle is Daniel in the lion's den and on the left is Abraham about to sacrifice Isaac. George Segal created figural sculptures by molding plastered gauze strips over live models in his 1987 work Abraham's Farewell to Ishmael. The human condition was central to his concerns, and Segal used the Old Testament as a source for his imagery. This sculpture depicts the dilemma faced by Abraham when Sarah demanded that he expel Hagar and Ishmael. In the sculpture, the father's tenderness, Sarah's rage, and Hagar's resigned acceptance portray a range of human emotions. The sculpture was donated to the Miami Art Museum after the artist's death in 2000. 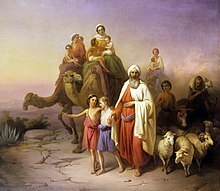 Usually Abraham can be identified by the context of the image – the meeting with Melchizedek, the three visitors, or the sacrifice of Isaac. In solo portraits a sword or knife may be used as his attribute, as in this statue by Gian Maria Morlaiter or this painting by Lorenzo Monaco. He always wears a gray or white beard. As early as the beginning of the 3rd century, Christian art followed Christian typology in making the sacrifice of Isaac a foreshadowing of Christ's sacrifice on the cross and its memorial in the sacrifice of the Mass. See for example this 11th-century Christian altar engraved with Abraham's and other sacrifices taken to prefigure that of Christ in the Eucharist. Some early Christian writers interpreted the three visitors as the triune God. Thus in Santa Maria Maggiore, Rome, a 5th-century mosaic portrays only the visitors against a gold ground and puts semitransparent copies of them in the "heavenly" space above the scene. In Eastern Orthodox art the visit is the chief means by which the Trinity is pictured (example). Some images do not include Abraham and Sarah, like Andrei Rublev's Trinity, which shows only the three visitors as beardless youths at a table. Fear and Trembling (original Danish title: Frygt og Bæven) is an influential philosophical work by Søren Kierkegaard, published in 1843 under the pseudonym Johannes de silentio (John the Silent). 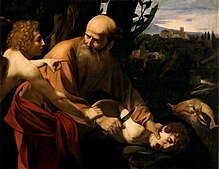 Kierkegaard wanted to understand the anxiety that must have been present in Abraham when God asked him to sacrifice his son. In 1994, Steve Reich released an opera named The Cave. The title refers to the Cave of the Patriarchs. The narrative of the opera is based on the story of Abraham and his immediate family as it is recounted in the various religious texts, and as it is understood by individual people from different cultures and religious traditions. Bob Dylan's "Highway 61 Revisited" is the title track for his 1965 album Highway 61 Revisited. In 2004, Rolling Stone magazine ranked the song as number 364 in their 500 Greatest Songs of All Time. The song has five stanzas. In each stanza, someone describes an unusual problem that is ultimately resolved on Highway 61. In Stanza 1, God tells Abraham to "kill me a son". God wants the killing done on Highway 61. Abram, the original name of the biblical Abraham, is also the name of Dylan's own father. ^ McCarter 2000, p. 8. ^ Levenson 2012, p. 8. ^ Ska 2009, pp. 26–31. ^ McNutt 1999, pp. 41–42. ^ Ska 2006, pp. 227–228, 260. ^ Moore & Kelle 2011, pp. 18–19. ^ Dever 2002, p. 98 and fn.2. ^ Thompson 2002, pp. 23–24. ^ Pitard 2001, p. 27. ^ Ska 2009, p. 260. ^ Enns 2012, p. 26. ^ Ska 2006, pp. 217, 227–28. ^ Ska 2006, pp. 217, 227–228. ^ Carr & Conway 2010, p. 193. ^ Ska 2009, p. 43. ^ a b Ska 2009, p. 44. ^ Peters 2010, pp. 170–71. ^ Levenson 2012, p. 3. ^ Ginzberg, 1909 & Vol I: The Wicked Generations. ^ Ginzberg 1909, Vol. I: In the Fiery Furnace. ^ Ginzberg 1909, Vol. I: The Covenant with Abimelech. ^ Ginzberg 1909, Vol. I: Joy and Sorrow in the House of Jacob. ^ Ginzberg 1909, Vol. I: The Birth of Esau and Jacob. ^ Peters 2010, p. 171. ^ Firestone, Reuven. "Abraham." Encyclopedia of World History. ^ Caxton, William. "Abraham". The Golden Legend. Internet Medieval Source Book. Retrieved 3 April 2014. ^ Levenson 2012, p. PA8. ^ Peters 2003, p. PA9. ^ Levenson 2012, p. PA200. ^ a b Exum 2007, p. 135. ^ Journal of Early Christian Studies, Leonard Victor Rutgers, The Iconography of the Sarcophagus of Junius Bassus (review of Malbon book), Volume 1, Number 1, Spring 1993, pp. 94–96; for Janson it is also the "finest Early Christian sarcophagus". ^ or 1595, see Elsner, p. 86n. ^ Abraham's Farewell to Ishmael. George Segal. Miami Art Museum. Collections: Recent Acquisitions.. Retrieved 10 September 2014. ^ "Abraham the Patriarch in Art – Iconography and Literature". Christian Iconography – a project of Georgia Regents University. Retrieved 18 April 2014. ^ Boguslawski, Alexander. "The Holy Trinity". Rollins.edu. Retrieved 3 April 2014. ^ Kierkegaard 1980, pp. 155–156. ^ "Highway 61 Revisited". Retrieved 25 March 2011. ^ "Rolling Stone's 500 Greatest Songs of All Time". Archived from the original on 13 September 2008. Retrieved 8 August 2008. Andrews, Stephen J. (1990). "Abraham". In Mills, Watson E.; Bullard, Roger A. (eds.). Mercer Dictionary of the Bible. Mercer University Press. p. 5. ISBN 978-0-86554-373-7. Barr, James (2013). Bible and Interpretation: The Collected Essays of James Barr. Oxford University Press. ISBN 978-0199692897. Barr, James (1993). "Chronology". In Metzger, Bruce; Coogan, Michael D. (eds.). The Oxford Companion to the Bible. Oxford University Press. ISBN 978-0199743919. Carr, David M.; Conway, Colleen M. (2010). "Introduction to the Pentateuch". An Introduction to the Bible: Sacred Texts and Imperial Contexts. John Wiley & Sons. ISBN 978-1405167383. Coogan, Michael (2008). The Old Testament: A Very Short Introduction. Oxford University Press. ISBN 978-0-19-530505-0. Davies, Philip R. (2008). Memories of Ancient Israel: An Introduction to Biblical History – Ancient and Modern. Westminster John Knox Press. ISBN 978-0664232887. Dever, William G. (2002). What Did the Biblical Writers Know, and when Did They Know It? : What Archaeology Can Tell Us about the Reality of Ancient Israel. Wm. B. Eerdmans Publishing. ISBN 978-0-8028-2126-3. Enns, Peter (2012). The Evolution of Adam. Baker Books. ISBN 978-1-58743-315-3. Exum, Jo Cheryl (2007). Retellings: The Bible in Literature, Music, Art and Film. Brill Publishers. ISBN 978-90-04-16572-4. Ginzberg, Louis (1909). The Legends of the Jews (PDF). Translated by Henrietta Szold. Philadelphia: Jewish Publication Society. Finkelstein, Israel; Silberman, Neil Asher (2002). The Bible Unearthed: Archaeology's New Vision of Ancient Israel and the Origin of Sacred Texts. Simon & Schuster. ISBN 978-0-7432-2338-6. Hatcher, W.S. ; Martin, J.D. (1998). The Bahá'í Faith: The Emerging Global Religion. Bahá'í Publishing Trust. Hendel, Ronald (2005). Remembering Abraham: Culture, Memory, and History in the Hebrew Bible. Oxford University Press. ISBN 978-0-19-803959-4. Hill, Andrew E.; Walton, John H. (2010). A Survey of the Old Testament. Zondervan. pp. 2024–2030. ISBN 978-0-310-59066-8. Holweck, Frederick George (1924). A Biographical Dictionary of the Saints. B. Herder Book Co.
Hubbard, David Allan; La Sor, William Sanford; Bush, Frederic William (1996). Old Testament Survey: The Message, Form, and Background of the Old Testament. Wm. B. Eerdmans Publishing. ISBN 978-0-8028-3788-2. Hughes, Jeremy (1990). Secrets of the Times. Continuum. Kierkegaard, Søren (1980). The Concept of Anxiety: A Simple Psychologically Orienting Deliberation on the Dogmatic Issue of Hereditary Sin. Princeton University Press. ISBN 978-0-691-02011-2. Levenson, Jon Douglas (2012). Inheriting Abraham: The Legacy of the Patriarch in Judaism, Christianity, and Islam. Princeton University Press. Ma'ani, Baharieh Rouhani (2008). Leaves of the Twin Divine Trees. Oxford, UK: George Ronald. ISBN 978-0-85398-533-4. May, Dann J. (December 1993). "The Bahá'í Principle of Religious Unity and the Challenge of Radical Pluralism". University of North Texas, Denton, Texas: 102. McCarter, P. Kyle (2000). "Abraham". In Freedman, Noel David; Myers, Allen C. (eds.). Eerdmans Dictionary of the Bible. Amsterdam University Press. pp. 8–10. ISBN 978-90-5356-503-2. McNutt, Paula M. (1999). Reconstructing the Society of Ancient Israel. Westminster John Knox Press. ISBN 978-0-664-22265-9. Mills, Watson E. (1998). Mercer Commentary on the Bible, Volume 1; Volume 8. Mercer University Press. ISBN 978-0-86554-506-9. Peters, Francis Edward (2003). Islam, a Guide for Jews and Christians. Princeton University Press. p. 9. ISBN 978-1400825486. Peters, Francis Edward (2010). The Children of Abraham: Judaism, Christianity, Islam. Princeton University Press. ISBN 978-1-4008-2129-7. Pitard, Wayne T. (2001). "Before Israel". In Coogan, Michael D. (ed.). The Oxford History of the Biblical World. Oxford University Press. p. 27. ISBN 978-0-19-513937-2. Shea, William H. (2000). "Chronology of the Old Testament". In Freedman, David Noel; Myers, Allen C. (eds.). Eerdmans Dictionary of the Bible. Eerdmans. ISBN 978-9053565032. Ska, Jean Louis (2006). Introduction to Reading the Pentateuch. Eisenbrauns. ISBN 978-1-57506-122-1. Taherzadeh, Adib (1984). "The Death of the Purest Branch". The Revelation of Bahá'u'lláh, Volume 3: 'Akka, The Early Years 1868–77. Oxford, UK: George Ronald. ISBN 978-0-85398-144-2. Thompson, Thomas L. (2002). The Historicity of the Patriarchal Narratives: The Quest for the Historical Abraham. Valley Forge, Pa: Trinity Press International. pp. 23–24, 36. ISBN 978-1-56338-389-2. Wilson, Marvin R. (1989). Our Father Abraham: Jewish Roots of the Christian Faith. Massachusetts: Wm. B. Eerdmans Publishing. ISBN 978-0-8028-0423-5. Wikimedia Commons has media related to Abraham. Wikisource has the text of the 1897 Easton's Bible Dictionary article Abraham. Wikisource has the text of the 1911 Encyclopædia Britannica article Abraham. Abraham smashes the idols (accessed 24 March 2011). "Journey and Life of the Patriarch Abraham", a map dating back to 1590.